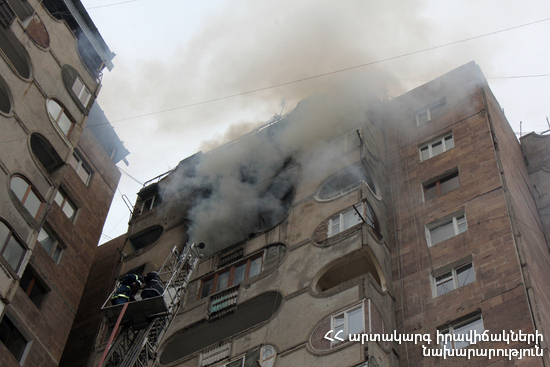 On April 11, at 08:28 an emergency call was received to “911” service that a fire had broken out in one of the apartments of building 27 in Moskovyan street, Yerevan. It turned out that the fire had broken out in one of the apartments of building 12 in Bayron street. The fire was isolated at 08:40 and extinguished at 08:54. A washing machine, central heating system (partly), suspended ceiling (about 4 m2) in the bathroom and electric wires (about 5 running meters) burnt.